Last summer, carfuls of millennials in trendy hats, plaid flannels and new hiking boots descended on Oz Farm, a vast, rural property five miles north of Point Arena, and settled in yurts and tents on the dusty ground. It looked like an Urban Outfitters catalogue shoot. The tents were provided by The North Face and dinner was catered by San Francisco’s Hook Fish Co. Bottomless vodka cocktails, free-flowing wine and kombucha on tap kept the crowd happy. The organizer of the overnight camping event was Hipcamp, an online startup that aims to upgrade the camping-reservation system and expose nature lovers to new experiences on private and public lands. Founded in 2013 by Alyssa Ravasio and Eric Bach, Hipcamp is often called the Airbnb of camping. “Hipcamp is everywhere you want to camp,” the company proclaims on its website. “Search, discover and book ranches, farms, vineyards, nature preserves and public sites for camping across the U.S.” Its goal is to simplify and improve the often unnecessarily complicated task of booking a campsite. Like many businesses, Hipcamp was born out of necessity and frustration. “I had this dream of spending New Year’s Eve 2013 camping so I could spend the first morning of the year writing in my journal by the ocean,” Ravasio says. “After many painful hours of searching, I almost gave up—it was so difficult to figure out where I could go.” She finally booked a place, but missed a key detail. Hipcamp initially covered only Northern California, an area “blessed with magical coastlines, soaring mountains and beautiful forests,” Ravasio says, adding the convenient proximity to tech-capital San Francisco as well. The website now covers all 50 states. Its popularity grew by word of mouth that was fueled by a clever referral program: refer a landowner and receive $100 if the landlord lists the site. For aspiring campers, things are made easy through a search engine that filters options by such features as “cave” and “beach”; activities such as “kayaking” and “fishing”; and amenities and types of lodging from RV parking to cabins. (Reviews are also provided.) Prices range from $35 for a campground to $175 for a rustic barn with a shower and a stove. Ravasio additionally stresses the communal aspect, which allows campers to mingle with owners and experience “the cultural exchange between urban and rural.” Not all owners will greet you personally, cup of coffee in hand, though many are onsite and willing to chat. “It’s a great chance for two people who are otherwise unlikely to meet to connect and learn from each other,” Ravasio says. Hipcamp is not alone on the camping trail. ReserveAmerica, a much older and established website, was the first to marry camping and technology, though Hipcamp’s youthful team and slick design set it apart and welcome lumbersexual millennials. It’s also right in line with the meet-the-locals premise, which promises an authentic experience and fresh air to cynical urbanites. Located in beautiful Mt. Tamalpais State Park, Pantoll Campground boasts 11 sites that you can drive or hike to. Once there, bike, climb, fish, explore … or just relax and enjoy nature. If you want to get away from it all, this is the place to go. Located in the Point Reyes National Seashore, it’s only reachable by boat, and there are several beach campgrounds to choose from. Boats can be rented at Blue Water Kayak in Marshall. Set across from the road and the main camping area in Samuel P. Taylor Park are four cabins with electricity and platform bunk beds that will accommodate up to five people. You can easily hike or bike in this idyllic forest setting. Just across the Sonoma County border in Mendocino County, this is a 600-acre “hippie-commune-turned-organic-farm” that offers a creek for impromptu bathing, seven rustic cabins, redwood campsites and styled-out geodesic domes. There’s a fully equipped community kitchen and an outdoor wood-burning pizza oven. A homestead farm with a Chardonnay vineyard that’s got plenty of room for tents between the vines. Refrigerator and bar facilities are available, and so is the opportunity to buy chicken and duck eggs straight from the farm. Located on Chanslor Ranch just north of Bodega Bay, this campsite is windy and rugged, and its location, on a small bluff, offers breathtaking ocean views. Salamander Ravine and Turtle Pond are short walks away. If staycationing the local way is an exciting notion, there are other websites representing homegrown and cozy adventures, often hosted in private residences. Verlocal.com is a relative newcomer that offers workshops and classes from pottery to making ramen in a casual setting. While a good portion of those take place in San Francisco, North Bay courses include wilderness survival in Marin County and a beekeeping workshop in Napa County. For food lovers who look beyond the trendy restaurants, there’s EatWith, an Israeli-born initiative that introduces diners to hosts and home cooks interested in hosting a dinner party, a brunch or a tapas affair. Happening mostly in large cities, EatWith nevertheless welcomes new hosts in slightly less central locations, so stay on the lookout, or become a host and contribute to other folks’ staycations. Few are the cynics who, like one prominent English wine critic, look at a verdant vineyard and see nothing more romantic than a potato field. Lots of folks just love the vineyards and long to roam through the vines. In December, we ran a story [‘Marin wine trail’] about Marin’s wine country. Here, we present a vino trail further north, because, after all, Sonoma County and Napa Valley are what some observers have called a remarkably Tuscan-like experience. Sound like the right kind of getaway? A number of wineries, most of them small, are adding to their bottom line while helping vacationers do just that by renting out their vineyard houses. Follow a collection of rusted crawlers past the old metal box that used to be the Monte Rio jail and up the drive to Joelle and Richard Prather’s three-bedroom rental overlooking their Horseshoe Bend Vineyard. Located just 70 yards from the Sonoma Coast viticultural area, the vineyard is surrounded by second-growth forest and supplies Schramsberg, Radio-Coteau and other wineries, as well as the Prathers’ own efforts—a bottle of which is included with your stay. Rates average $333, Monte Rio jail not included. occidentalroadcellars.com. It’s no extravagance to travel across the pond for the weekend, if it’s the placid little pond behind the Landmark tasting room. Here’s a little cottage just for two—or more, with the sofa bed employed—within walking distance of Kenwood area dining and hiking. It starts at $325 a night, a comparative economy rate for private accommodations in wine country. (Clearly, the owners of Pom Wonderful aren’t counting on the extra dough.) A guest suite is also available from $300, including continental breakfast and a bottle of gently oaked Overlook Chardonnay. landmarkwine.com. You’ve seen one lurid, Victorian wallpapered B&B room too many? Stay in a crib owned and decorated by Swedes. Katarina Bonde and Bengt Akerlind rent out a tidy, three-bedroom cottage they call the “Big Oak House” adjacent to their tasting room, just outside of Healdsburg. It’s the oak that’s big, not the house, but it can accommodate up to eight people for a big weekend in Dry Creek Valley. Rates from $395 to $650. westwines.com. Yes, even in rural Alexander Valley there’s at least one way to fulfill your dream of staying in a real, faux-French chateau, complete with private driver: members of Jordan’s Platinum and Gold rewards clubs may purchase winery stays for as little as $50—plus 5,000 points. That’s a lot of wine, so start stocking up soon. jordanwinery.com. In Napa Valley, county regulations prohibit wineries from operating a rental for less than 30 days at a pop, so options are limited. But they are luxurious. 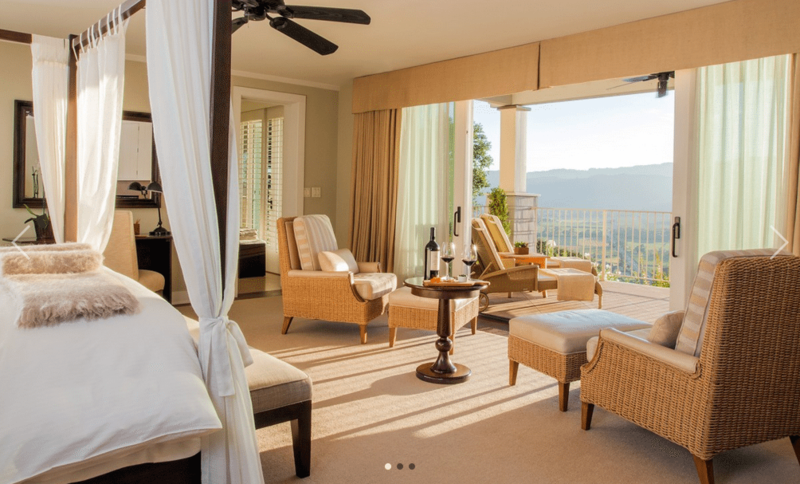 Napa’s Poetry Inn offers rooms with high ceilings and valley views. Photo courtesy of Poetry Inn. open-air showers that overlook Napa Valley. Casual luxury is the mode in this joint, where the uniquely furnished rooms are named for beard-scratchers and tortured souls—poets Walt Whitman, e. e. cummings, Robert Frost, Robert Louis Stevenson and Emily Dickinson. The tub in the Whitman is vast, and could very well contain multitudes. Rates start at $650 in winter and top $1,900 in summer—but that does include a three-course breakfast. With kale! poetryinn.com.